Charlie Whitehead in Drama on 16 March, 2017. 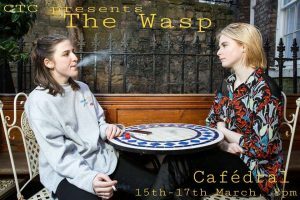 CTC’s production of ‘The Wasp’ was a highly engaging and unpredictable performance, dealing with some traumatic but important issues that gambled with the audience’s emotions throughout the duration of the play. Director Alex Marshall deserves credit for this unique choice of production, staged in the familiar yet unusual setting that is the Cafédral. The setting itself was a wise decision. The quaint and friendly atmosphere of the café – made even better with the offer of a buttered scone upon arrival – was suitably juxtaposed with the play’s harsh and somewhat disturbing themes. The producer, Carrie Gaunt, managed to successfully construct a set that was aesthetically attractive and innovative, effectively making use of the limited space. The two actresses, Damson Young as ‘Heather’ and Alexandra Hannant as ‘Carla’, tackled some very complex characters, tasked with having to communicate and act out scenes that some viewers may have found distressing. Both were exceptional in their performances and must be commended on such a mature level of acting, given the sensitive nature of the themes. Hannant convincingly executed the restless and intimidating personality of Carla, whilst Young perfectly outlined a subdued yet psychologically disturbed portrayal of Heather. Both characters were comfortably sustained throughout the performance, yet it would be worth mentioning that Hannant must remember to remain in her character at the start of the play, when everyone takes their seats, allowing for a more plausible opening. With this in mind, the start of the play was quite abrupt, with certain members of the audience not knowing whether the play had actually begun or whether there was a lull in general conversation. Young, on the other hand, gave a strong performance throughout. However, her occasional lack of movement and fixed gaze upon Hannant did her more harm than good. She should try to project her voice more towards the audience whilst still clearly addressing Hannant. Unfortunately, in the second half of the play, the entire right side of Young’s body and profile were all that certain members of the audience could see, therefore leaving us unaware of her facial expressions or general conduct. These are aspects that are incredibly significant and should very much be focused on with a play such as ‘The Wasp’. Having said that, both Young and Hannant did a remarkable job, particularly when they were revisiting memories of their past, showcasing experiences that are still relevant yet haunting in today’s society. Their respective monologues, especially towards the end of the play, are a true highlight, with one line, ‘there seems to be no solution to violence than more violence’ resonating with the audience in a poignant manner. The play sparked elements of humour that added to the play’s general charm and uneasiness. Whilst certain moments remained a little static, with the set-up having the potential to be awkward (the audience had to move their chairs at the end of the first half), ‘The Wasp’ was an emotionally entertaining and thought-provoking piece, leaving the audience speechless at times. Who knew that a meeting over an innocent cup of tea could culminate into an unforeseeable set of events, leaving the audience constantly guessing as the play planted doubts in our minds? 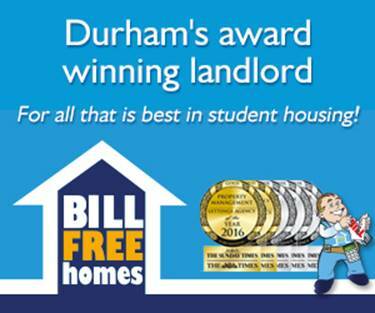 Marshall and the rest of his team should be very proud of their production, and I would highly recommend this as a break from those end of term summatives.